A sweet and savory collection of more than 100 foolproof recipes from the reigning "Queen of Baking" Mary Berry, who has made her way into American homes through ABC's primetime series, The Great Holiday Baking Show, and the PBS series, The Great British Baking Show. 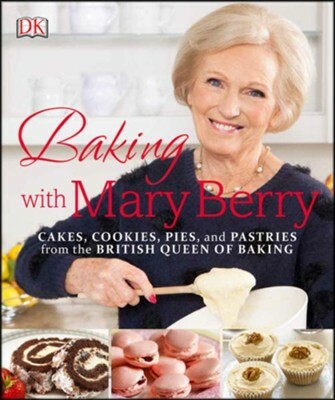 Baking with Mary Berry draws on Mary's more than 60 years in the kitchen, with tips and step-by-step instructions for bakers just starting out and full-color photographs of finished dishes throughout. The recipes follow Mary's prescription for dishes that are no fuss, practical, and foolprooffrom breakfast goods to cookies, cakes, pastries, and pies, to special occasion desserts such as cheesecake and souffl&eacute;s, to British favorites that will inspire. Whether you're tempted by Mary's Heavenly Chocolate Cake and Best-Ever Brownies, intrigued by her Mincemeat and Almond Tart or Magic Lemon Pudding, or inspired by her Rich Fruit Christmas Cake and Ultimate Chocolate Roulade, the straightforward yet special recipes in Baking with Mary Berry will prove, as one reviewer has said of her recipes, "if you can read, you can cook." Mary Berry is one of the UK's best-loved and most respected cooking writers and bakers, with more than 80 books to her name and over 6 million copies sold. She is a judge on the primetime ABC series The Great Holiday Baking Show and the PBS series The Great British Baking Show, based on the hit BBC TV program (The Great British Bake Off). Her focus on family food and on recipes that are no fuss, practical, and foolproof have won her a legion of fans worldwide. She lives in England and has five grandchildrenwith whom she regularly bakes. I'm the author/artist and I want to review Baking with Mary Berry.